Servertastic For cPanel will allow your clients to automatically install SSL certificates on their websites. You will easily trace the progress on SSL configuration, toggle automatic renewals and handle other essential HTTPS features. Your clients, at once, will be given the opportunity to supervise owned certificates straight in your cPanel area. 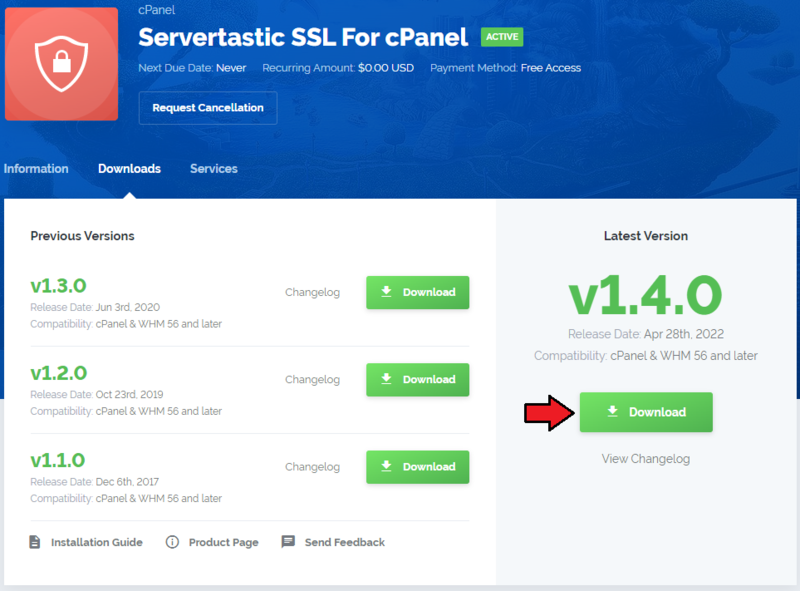 This tutorial will show you how to successfully install and configure Servertastic SSL For cPanel. 2. Upload and extract the module into the /root cPanel directory. Files in your cPanel /root/ServertasticSSL directory should look like these on the following screen. Next, follow the instruction displayed on the console. Type the yes command to confirm. After a brief moment you should see a confirmation that the plugin has been successfully installed. 4. In order to configure the plugin, go to 'WHM' → 'Plugins' → 'Servertastic SSL' . Test Mode - select to connect to the test API. 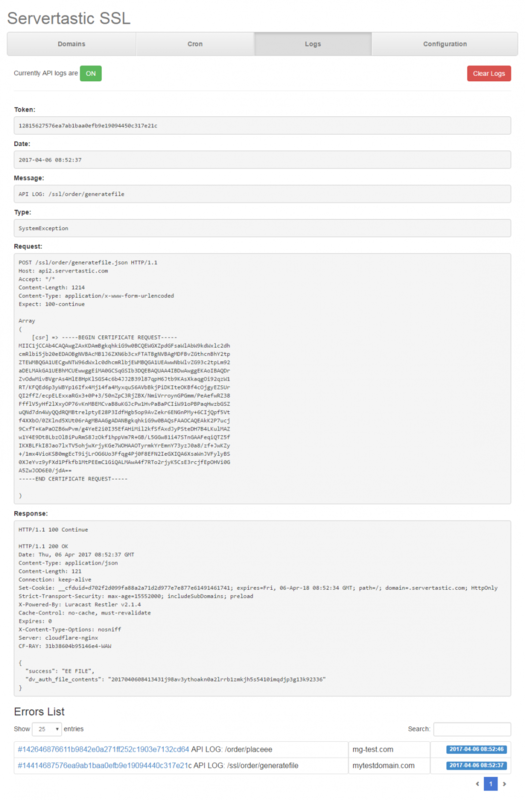 API Logs – if selected, all requests and API responses will be recorded in the Logs section. Cron Retry Limit – define the number of maximum allowed retries of a single request. Notifications Email – provide an e-mail address where notifications of issued certificates will be delivered. Verification Method – choose File or DNS verification method to validate domain ownership automatically. Auto Renew – if selected, the certificate will be automatically renewed 30 days before its expiration date. When ready, test the connection and save the configuration. Your module is almost ready to use. 6. 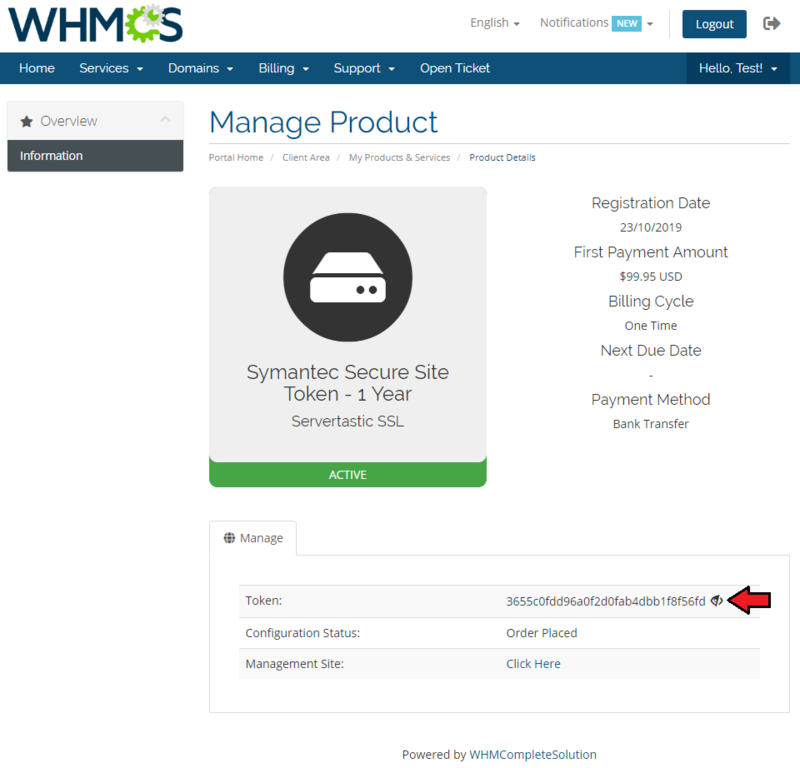 Due to the fact that cPanel does not support customer transactions, the Servertastic SSL For WHMCS module can be used to sell paid certificates. Hence, customers will be able to purchase certificate tokens in WHMCS, which can be later on used to set up certificates for domains in cPanel. The instructions for installing the provisioning module for generating tokens in WHMCS can be found on the Servertastic SSL For WHMCS documentation. Follow the next steps when ready. 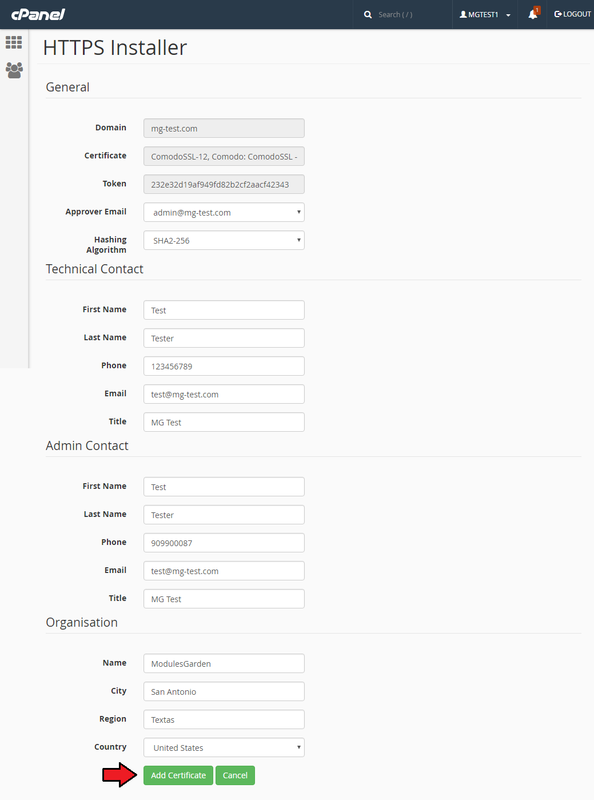 Servertastic SSL For cPanel allows you to offer SSL certificates to your clients. Moreover, you have the ability to view the details and take control of each provisioned certificate. In the WHM area you can track essential details of each certificate and monitor the status of SSL configuration. In addition, you can explore Cron and API logs. 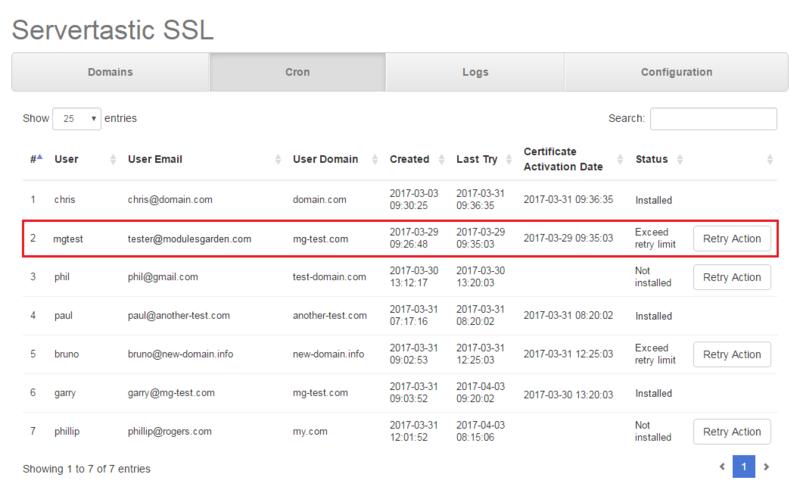 In this section you will find all domains available in WHM as well as important information concerning installed certificates. 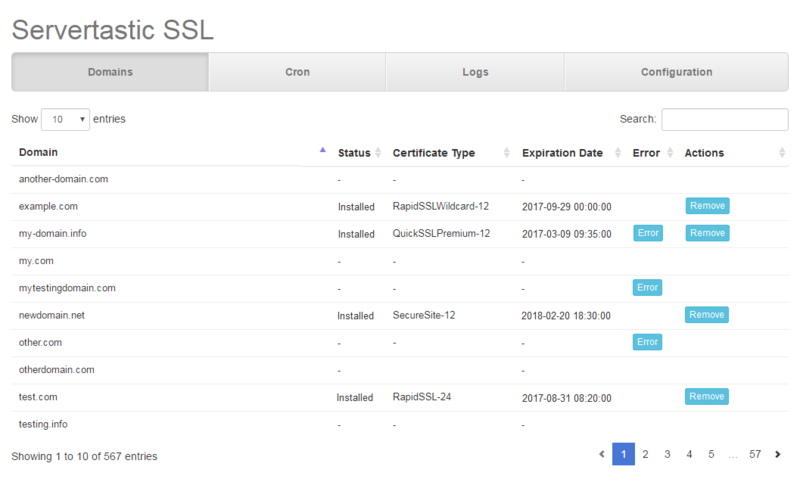 You can view the current status and type of each certificate along with its expiration date, as well as use the option to Remove certificate. 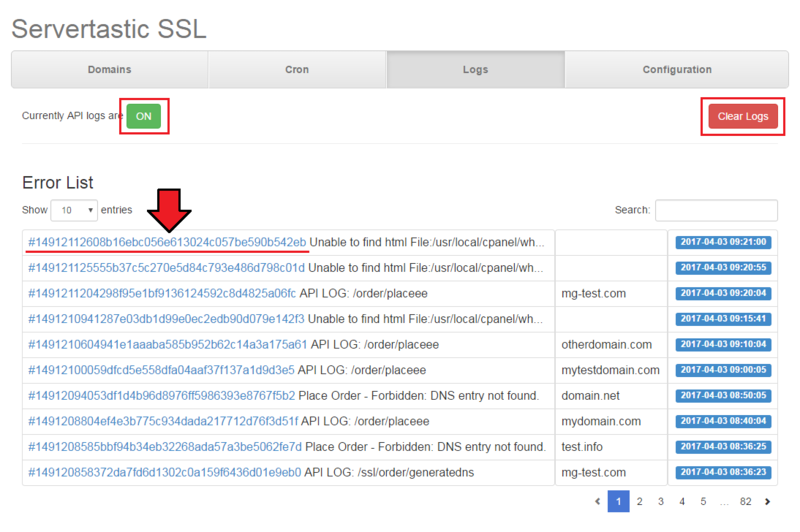 Click the 'Error' button to see detailed logs of any API errors. In the Cron section, you will find all existing cron tasks. Tasks are added in case any error occurs followed by a verified request for certificate installation. As you can see, the administrator can either manually trigger the action again or wait for the next cron run (the cron runs every 5 minutes by default). The Logs section includes the list of all failed cron executions. You can clear the logs if necessary. Please remember that you may always turn the logs off in the configuration tab or by switching the button On to Off. Clicking on the Token number will move you to the more detailed error log with the API requests and responses. Servertastic SSL For cPanel allows your customers to set up and configure SSL certificate for main or addon domains. Log in to your cPanel account. Then proceed to the 'Security' → 'HTTPS Installer' . You can see the list of your domains with their current status. 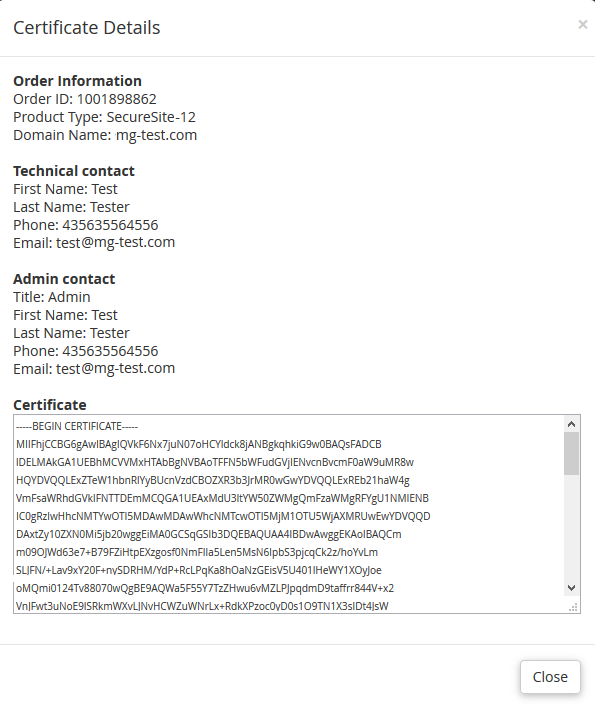 Press Use Token for a given domain to submit the request for a certificate. Note: Remember that in order to get a token, it is necessary to make integration with WHMCS. Next, enter the obtained token and click on the 'Add Certificate' button. If the token is correct, you will be taken to the form where you need to fill in the Admin, Tech and Organisation contact details as well as choose approver email and hashing algorithm. Keep in mind that availability of certain fields may depend on the type of ordered certificate. Press Add Certificate when ready. In case any issues occur while verifying the request, a cron task is automatically added to the line. The administrator may then trigger the action manually or wait until the system runs cron to process the request again. If the verification is successful and the domain certificate is installed, the relevant information appears on the list. 2. Due to the reason that Servertastic has dropped support for the free certificates, the module is no longer supported them from version 1.1.0. Use the token system for sell paid certificates in WHMCS module instead. This page was last modified on 11 March 2019, at 10:09. This page has been accessed 19,853 times.